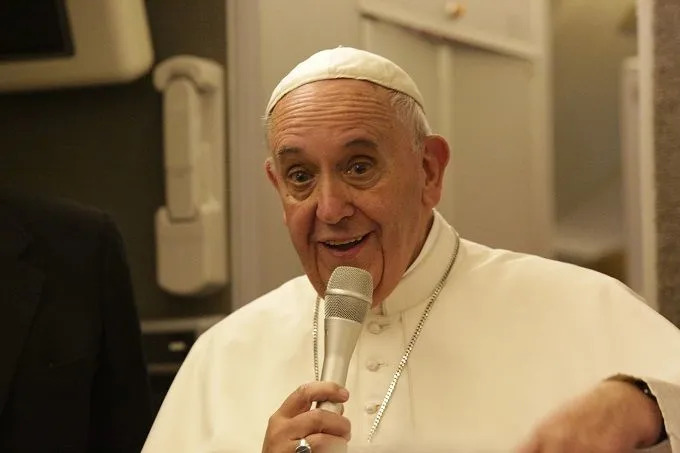 Pope Francis speaks to journalists aboard his flight from Philadelphia to Rome Sept. 27, 2015.
as well as the upcoming synod of bishops and women’s ordination. Airlines overnight flight from Philadelphia to Rome. the questions and answers. He introduced each of the journalists before their questions. to the other and I was in a car but you…thank you very much. different to what you might have expected? and also by the piety, the religiosity of the people...you could see the people pray and this struck me a lot. Elizabeth Diaz, Time Magazine: And the challenge? Pope Francis: We must continue to work with these faithful people like we have always done so until now. you why did you feel the need to offer compassion to the bishops? cried a lot” That was the sense of what I meant and today I spoke strongly. and that we often ask for forgiveness. I would like to ask you, after you were at the seminary today. victims or their relatives who can’t or don’t want to forgive? willing. But not everyone can receive or know how to receive it, or are just not willing to receive it. hardened, badly, without receiving the tenderness of God. Maria Antonieta Collins, Univision: On victims or relatives who don’t forgive – do you understand them? she became blasphemous, she lost her faith and she died an atheist.” I understand that woman. God is a champion in finding paths of solutions. I ask him to fix it. when this agreement was made, right? Now there are a lot of Colombians awaiting you. And a little one, how do you feel when the trip is over and the airplane takes off? international justice. I was very happy and I felt like I was a part of it because I’ve always wanted this. was always willing to help and do what it could. I feel. Excuse me, it’s a bit personal…you can’t say that in the newspapers. Thomas Jansen, CIC: Holy Father, I wanted to ask something about the migrant crisis in Europe. Many countries are building new barriers out of barbed wire. What do you think of this development? this process has exploded because the wars which those people leave and flee are wars waged for years. Hunger. It’s hunger for years. When I think of Africa, this is a bit simplistic, but I saw it as an example. what happens to all walls. All of them. All walls fall. Today, tomorrow or in 100 years, they will fall. remains but it also remains with more hate. That’s what I think. the door to the administrative path, which was the path through which divorce could have entered. The document…I don’t remember the third but you correct me. proprio has closed the debate before the synod on this theme? sentence, and after there's an appeal, there's the appeal then another appeal. It never ends. to do it. The synod fathers asked for it, the speeding up of the annulment processes. And I stop there. because marriage is indissoluble when it is a sacrament. And this the Church cannot change. an investigation. That there was no sacrament. For example, that the person wasn't free. in these conditions. We called them “speedy weddings,” eh? (They were) to cover up appearances. we had to cover up this situation’ and this is a reason for nullity. So many of them. married. It's a pastoral problem for the Church. Another problem: the affective maturity for a marriage. for eight years, and then, its not definite, the Church can take the clerical state away from you. the synod has to deal with: how to do preparation for marriage. It’s one of the most difficult things. this is nullity – it didn't exist. And if it did, it's indissoluble. This is clear. Thank you. before them was the baptismal font – the baptismal font or the sword. And, they had to choose. have to respect all rights. Terry Moran, ABC News: Would that include government officials as well? Pope Francis: It is a human right and if a government official is a human person, he has that right. the World Meeting of Families because you invited him. Can you tell us how it went? Pope Francis: I will start with your second question. I did not invite Mayor Marino. Is that clear? about bombardments. Truly, I heard the news the day before yesterday, and I haven’t read about it. because I don’t know enough about it. for the Catholic Church. What do you think about this? Pope Francis: China is a great nation that offers the world a great culture, so many good things. to do good, would be a joy. you draw attention to the role of religious women, of the women in the Church in the United States. some other Christian churches have? Pope Francis: He’s telling me not to answer in Spanish (referring to Fr. Federico Lombardi). The sisters in the United States have done marvels in the field of education, in the field of health. I have, I owe above all to the sisters.” The sisters have schools in all neighborhoods, rich and poor. with your schedule and having been successful? still make progress on this path of service because I feel that I don’t do everything I should do. That’s the sense I have of power. feminine articles in Italian) It is “la” Church, not “il” Church. The Church is the bride of Jesus Christ. a bit late in an elaboration of the theology of women. We have to move ahead with that theology. Mathilde Imberty, Radio France: Holy Father, you have become a star in the United States. Is it good for the Church if the Pope is a star? 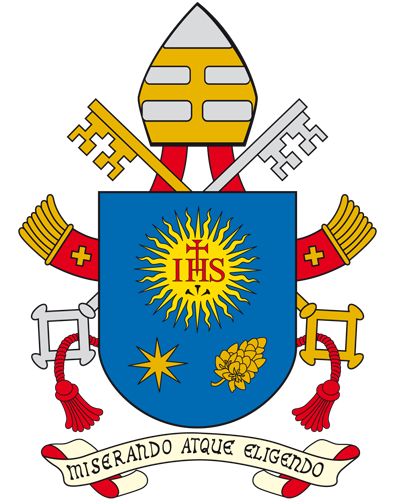 Pope Francis: The Pope must…Do you know what the title was of the Pope, which ought to be used? Servant of the servants of God. It’s a little different from the stars. Stars are beautiful to look at. servant of the servants of God. Yes, in the media this is happening but there’s another truth. being servant of the servants of God is something that doesn’t pass. Fr Federico Lombardi thanks the Pope. Pope Francis thanks the journalists and it’s over. (Vatican Radio) Pope Francis resumed his General Audiences on Wednesday, following the summer holiday. In his catechesis, the Holy Father continued his teaching on the family, reflecting on the situation of those who have divorced and entered into a second union. “The Church knows well,” he said, “that such a situation contradicts the Christian Sacrament.” However, he continued, the Church, as a Mother, always seeks the good and salvation of all her children. The Pope said it is important for the Church to foster a true welcome for these families in our communities. The Church must always show her pastoral care for those in such situations, especially the children. Pope Francis noted that the Church in recent decades has developed a greater awareness of the need to be welcoming toward the divorced and re-married. He emphasized that they are still part of the Church – they are not excommunicated, and should not be treated as such, but rather must be encouraged, with their families, to participate in the Church’s life: through prayer, listening to the Word of God, the Christian education of their children, and service to the poor. He pointed to the words of Pope Benedict XVI, who called for careful discernment and wise pastoral accompaniment, while recognizing that there are no “simple solutions” to the difficulties wounded families face. The Church, Pope Francis said, should imitate the Good Shepherd, welcoming all her children as a mother who is willing to give her life for them. “Each one of us can do our part by having the attitude of the Good Shepherd, Who knows every one of His sheep, and excludes no one from His infinite love."